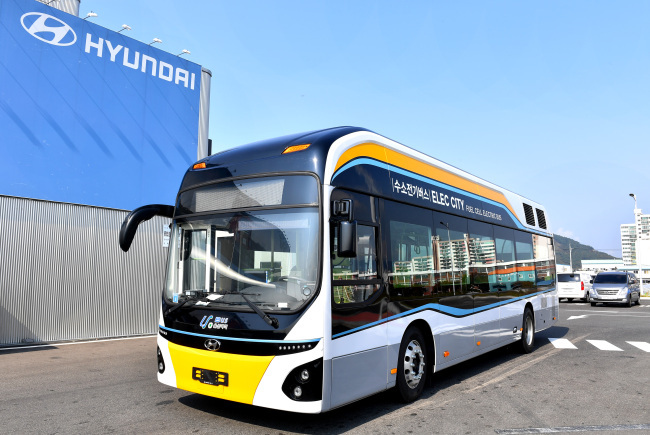 Prime Minister Lee Nak-yeon has made a proposal to replace police buses with fuel cell buses to promote the nation’s leading hydrogen technology. Currently, the police operate 5,581 buses, according to the Korea National Police Agency. The prime minister was specifically referring to wire-covered police buses typically deployed around government complex buildings and the US Embassy in central Seoul for the reason of keeping public order. Lee did not clarify whether he was suggesting to change buses parked at Gwanghwamun only or the entire police bus fleet. Replacing hydrogen buses for the police would help reduce micro dust in the center of the city and promote public awareness on zero-emissions cars, he said, adding it would expand domestic sales of such vehicles. The premier also ordered his office to draft a report on ways to ease regulations to promote the use of hydrogen and electric vehicles by next month. Touting Korea’s leading role in driving fuel cell and hydrogen technology, Lee also referred to President Moon Jae-in’s surprise test drive of a Nexo, the latest fuel cell electric vehicle from Hyundai Motor, in the heart of Paris, last week. Powered by hydrogen, Nexo can run up to 609 kilometers on a single charge, the longest range for a green car in the world, according to the company. Nexo, unveiled in January this year, was developed after the South Korean carmaker succeeded in mass producing the Tucson ix35 for the first time in the world.